I spend much of my existence celebrating situations, peculiar thoughts and pondering how certain music could or perhaps should have been made with cinematic notions/storyboards in mind. Dream evoking Australian singer-songwriter Loene ‘Lo’ Carmen makes music that easily allows these celluloid escapes. Her newest lo-fi wonder ‘Everyone You Ever Knew (Is Coming Back To Haunt You) maneuvers in shadowy and palpable Lou Reed-esque honky tonk realism with so much rare and raw individuality that it takes you aback at first listen. Then your eager addiction slowly burns inside until you’ve played the album on repeat countless times and you’re lost in her personal visons laid out in tracks imagined by a true storyteller who’s looking at and translating her world with one of a kind human perspectives. I like to imagine Andy Warhol and Gram Parsons curating an inspiring and quirky film soundtrack by Van Sant or Lars von Trier. This is how I listen to this album. 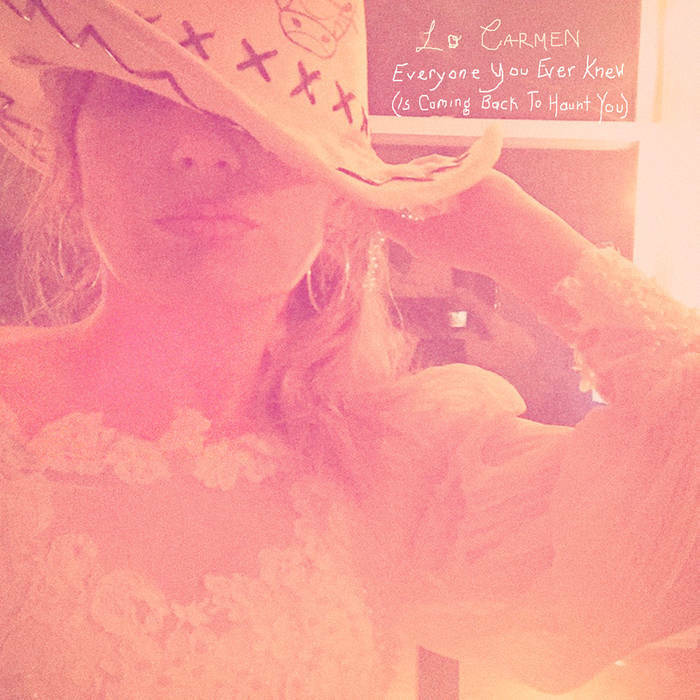 I asked the songwriter if she would go deeper, share her stories behind the album’s tales and this is Lo Carmen’s track x track ‘Everyone You Ever Knew (Is Coming Back To Haunt You). This is actually more about people that are alive than dead. Partly inspired by social media. I’m not very sentimental and have a really bad memory and it seems that everywhere you go people you have long forgotten about turn up again. And everyone knows each other’s business and life events and there’s nothing to tell each other when you bump into someone. And everyone has their own versions of the same events. And it’s happening to everyone! Maybe that’s just my age. All I know is that the chorus from this song literally haunted me for years before I finished writing the lyrics the night before we hit the studio. Tex Perkins once told you have to write your own eulogy, and since he is one of my very favorite songwriters, I try to listen and learn. I have a lot of things that once belonged to someone else, some special and sentimental cos I know where they came from, and some I have no idea of their history and it can make me wonder…. it got me thinking about what I’d leave behind and what would happen to that stuff…and then quite peculiarly my teenage idol, Australian soul singer Wendy Saddington who my father played music with, died soon after I wrote the song, and I was given her black tambourine. That blew my little mind a little bit. My friend Eva told me when she was a little girl she had an apricot tracksuit that sported the words ‘Memories can drive you crazy you know’. I wrote the entire song just to get that line in. This is really just about how no one can learn from another person’s mistakes; you gotta mess up and be annoying in your own way and in your time. You gotta make your own fun! We had really only rehearsed it once and then we went to record we couldn’t recapture that feel, coz the song is lyric led and weird timing – we ending up getting this strange groovy spiky strut going on instead that I love, it sounds like New York to me! Ian Rilen is one of Australia’s most legendary rock’n’rollers, who truly lived by all the rock’n’roll rules. An incredible performer, amazing lyricist, singer, musician and serious troublemaker. He was also an absolute sweetheart. When he was dying from liver cancer some years ago, our mutual friend Jim Bowman sent me a tune he had written and asked me to write some lyrics for Ian to sing. He was too sick to write but willing to record. I wrote the lyrics for Green Eyes in one hit, imagining Ian lying there just looking at his children and thinking of them and the women and the life he loved. Jim sent him the demo and he loved it, but he ending up being too sick to record it before he died. I never considered singing it myself until I was getting songs ready to record and it just kept coming into my mind. I asked the boys to play it like Marianne Faithful’s As Tears Go By or one of those spooky girlie folk songs and they just took it by the horns and shook all that breeze into it. I know Ian would love it. Ian Rilen’s “401” – the sexiest love song to a car ever written. I just thought about the fact that when you think about losing someone from your life, it’s not just them but all their familiar body parts that become foreign too. This song was also inspired by one line that I thought was funny, in a story about a rock star asking his driver to silence the radio ‘Please turn that off, it’s like a knife to my heart’. The rest is just facts and personal philosophy really. Sorry not much of a story here. One night I stumbled across an article on the internet about Jutta Hipp, the first female signed to Blue Note Records. She was a German jazz pianist and Leonard Feather had heard her in a soldiers bar there and invited her to go to New York, where he signed her, talked her up, mentored her, got her great gigs all round town and she was a star on the scene. According to the article I read, Feather then asked her to record one of his compositions. She wanted to, out of gratitude to him, but she simply didn’t like it, and thought it was an inferior tune, and so she refused. He was hurt and furious and basically withdraw all his support, badmouthed her and she could no longer get the cool gigs or make enough money to survive. She eventually got a job as a seamstress in a factory in Brooklyn and retired from playing, and never touched a piano again, or even mentioned her former career to her workmates. What really touched me though was that she continued to go and watch jazz, alone, taking photographs and painting pictures of the musicians but keeping to herself. I’ve never been able to find the article again so I can’t verify the truth of this story, some other articles I’ve read have suggested it’s not quite correct, but I’ve never let the truth get in the way of a good song so I wrote the lyrics and then Sam Worrad presented me with this strangely jaunty kind of tune, which was an odd but perfect fit for the words. This song is really a reflection on how life can just turn on a dime, and you never know when its coming. Gwennie was a very glamorous, elderly family friend, always dressed to the nines and loved a chat. She had Alzheimers and what struck me was that period of time of that was so strong for her was when she was this independent milliner, girl of the moment, talk of the town in the 1940’s, everyone wanted one of Gwennie’s hats! Most of the lines in the song are things she said to me at least a few times. It also fascinated me how as humans we tend to relay a story the same way, the same turn of phrase, over and over, if it worked well for us in the telling. I just loved her saying ‘Men would stop me in the street and beg me ‘Where’d you get that hat?? ?’ so gleefully. Gwennie just died just a few weeks ago and her son played this song at her funeral. I’m sorry she never got to hear it. When we recorded it Cec kept playing after the song ended, like a heartbeat slowly fading. I thought that was beautiful. This is just one of those rambling stream of consciousness things I scrawled one day many moons ago in a strange reclusive mood and then looked at it years later and thought, hmmm, maybe there’s a song in that if I cut seven pages out….Sam and Cec whipped up the tune pretty much on the spot and we just did the one take I believe.